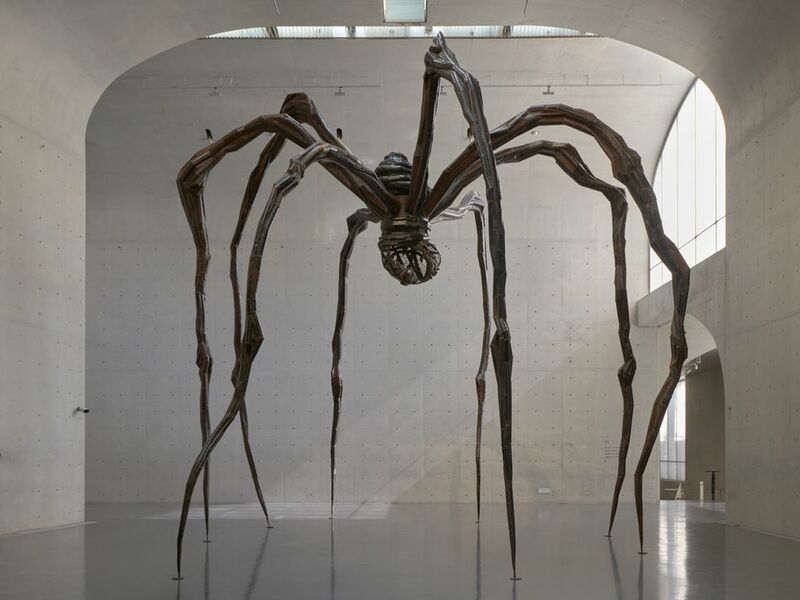 The Long Museum’s c­­­avernous concrete halls might have been made for Louise Bourgeois’s work, never more so than in the case of her huge bronze spider, Maman—on loan from the Tate, it has travelled from London’s South Bank to greet visitors on entry to the private museum on Shanghai’s West Bund. For the French-American artist’s first large-scale solo show in China, the curator Philip Larratt-Smith (formerly Bourgeois’s literary archivist) has taken a line from one of her diaries as his title. The Eternal Thread (until 24 February 2019) affords him the flexibility to spiral out from the Personage sculptures from the late 1940s, through a group of 1990s Cell installations, to her late fabric and spider works and a huge aluminium piece, The Couple, hanging here in public for the first time ever. Heavy with symbolism and contradiction, Bourgeois’s work has rarely looked so fearsome, nor so delicate. The exhibition, in collaboration with The Louise Bourgeois Studio, will travel to Song Art Museum in March 2019. Katharina Grosse’s first solo-show in China—and her first in a shopping mall—is an ambitious undertaking, and sees the German artist take over the entire 1,500 sq. m of the Chi K11 Art Museum with five “zones” of her trademark variegated spray-painted installations. Mumbling Mud (until 24 February 2019) was produced almost entirely onsite, with a team of Chinese assistants installing the bare materials (including soil, building materials, living room furniture and, of course, huge hanging swathes of canvas) before Grosse moved in two weeks later to start painting. On entering, you are straight into what Grosse describes as the most “saturated and unruly” of the installations, clambering over a technicoloured demolition site, before then encountering the cool white body of Ghost, a sculpture carved from Styrofoam using a hot metal wire which cuts through it “like butter”, Grosse says. After walking over, through and around these vivid large-scale paintings, ending in a living room sprayed white, you stumble out into the shopping mall again—a Shanghai shrine to luxury, Grosse’s mounds of technicoloured earth and sand bags seemingly a world away. It is worth making the trip out of the city centre to the Shanghai Museum of Glass to walk on Liu Jianhua’s fractured floor— quite literally, to quote Annie Lennox, walking on broken glass. An eerie sensory experience awaits, as shards of glass crunch underfoot and a skin-pricking wind blows through the semi-open space—it is as if the windows have been blown in, we have walked into the aftermath of…something. Liu began his career working at the renowned Jingdezhen Pottery and Porcelain Sculpture Factory, and he is now one of China’s best-known sculpture and installation artists. Although he uses materials such as porcelain, associated with China’s cultural heritage, the subject behind his works tends to focus very much on globalisation and social issues within China. The show, titled Effect (until 31 May 2019), is part of the Annealing Program, directed by Li Li who has, since 2014, been inviting artists to conceive projects which use more unusual media, such as glass.